�����Market prices have trended downward over the past two weeks, mostly because of the falling metal prices, with Gold down over $100 from its high and Silver down 10%. Concerns over the conflict in Egypt have investors equivocating for the time being. Proof Gold Eagles are trading at $1,560 on a wholesale basis for one ounce coins in the original package. Yet, we are still monitoring a lot of trading activity on the Teletype systems. 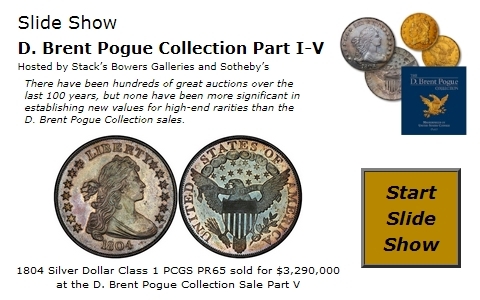 �����Long Beach week is here and, with another interesting Heritage Galleries Signature Sale, there should be plenty of new coins available. While prices are down due to the lower metals, many feel this could be a good show for buyers. We continue to see high value rarities trading, some at slight discounts, but most commanding nice premiums. �����Even with lower metal prices, this week's LD Wholesale Market Dealer Price Guide has some increases, mostly from the final results of the FUN Show. Better Date Lincoln Cents in MS64 and higher are advancing, especially in Red, with a variety of increases from 1909 through 1933. The 1925 S Red in MS64 is up to $2,825 Market and in RB it is $675. This is a very tough date to find well struck. The very popular 1914 D RB in MS65 is higher at $7,850. Market prices have increased for the rare 1872 Two-Cent in MS63 through MS66 in both RB and Red. This coin is very scarce and not easy to locate in these higher grades.